Blue Origin CEO Jeff Bezos indicated that the “Blue Moon” lander could be used for deliveries to the lunar surface in the 2020s followed by a delivery of lunar ice from Shackleton Crater back to Earth soon afterward. The lander, which sports four legs and a golden lower stage reminiscent of the Apollo lunar lander, could be launched on Blue Origin’s New Glenn rocket, NASA’s Space Launch System, or even a United Launch Alliance Atlas V.
Blue Origin President Rob Meyerson said that Blue Moon’s cargo mission would complement NASA’s crewed Orion missions to lunar orbit or even settlements on the lunar surface. Meyerson also said that Bezos was willing to put some of his own money into the program. Displayed at the Symposium venue was the company’s New Shepard suborbital test vehicle as well as the interior of the rocket’s capsule interior. 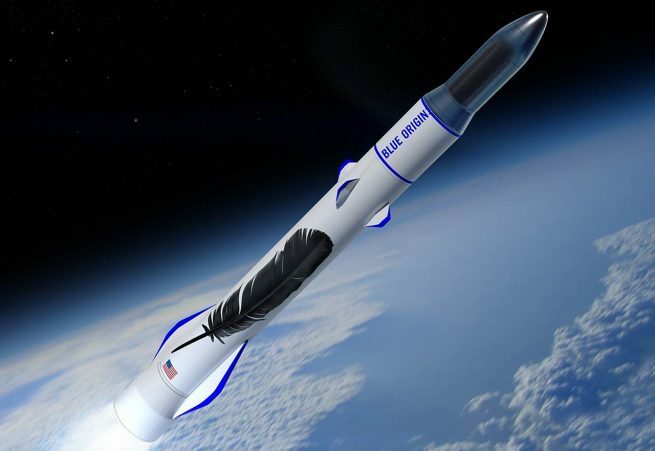 According to Jeff Foust in The Space Review, Bezos did not make any major announcements regarding the ongoing development of New Shepard, Blue Origin’s first commercial vehicle. Considering the vehicle still in testing, he said he was hopeful that human flights could begin in 2018. “It’s really going to be when we’re ready,” Bezos said. Bezos, who owns Amazon.com, said he was selling “a billion dollars a year” worth of Amazon.com stock to pay for operations. Being the largest shareholder of the company, he owns 80.9 million shares, according to Fortune, and would have to sell 1.09 million shares to meed the $1 billion worth of stock. Regardless, Bezos said he still has his eye on profitable operations for all phases of Blue Origin’s efforts, from suborbital tourism to lunar cargo. It makes enormous sense to develop lunar ice deposits and a lunar base before going to Mars. The lunar ice and other materials can be used to fuel a Earth-Moon shuttle and eventually an Moon/Earth-Mars shuttle. The lunar metals can be developed on the moon for orbital and shuttle spacecraft construction. The moon would give experience for humans working off world and develop much more assessable materials for space construction and fueling. I don’t get it, blue origin hasn’t even achieved one whole orbit yet and is already talking about reaching the moon. I mean, seriously, it took NASA 8 years to reach the moon from when Alan Shepard flew to Space in 1961. We have 2 companies, neither have launched anyone anywhere, but folks are only critical of one of the two companies claims? Guys, the practice of claiming to have standards or beliefs to which one’s own behavior does not conform – isn’t something you’d want to be identified as behaving like.